Hurricane Sandy, which devastated the Eastern Seaboard in 2012, killed 233 people and caused more than US$70bn worth of damage. At the time, it was the second-costliest hurricane on record in the US, until Harvey and Maria struck in 2017. Caught up in the destruction was New York, which was battered by Sandy. 53 people died during the hurricane, with economic losses in New York City estimated at US$19bn. 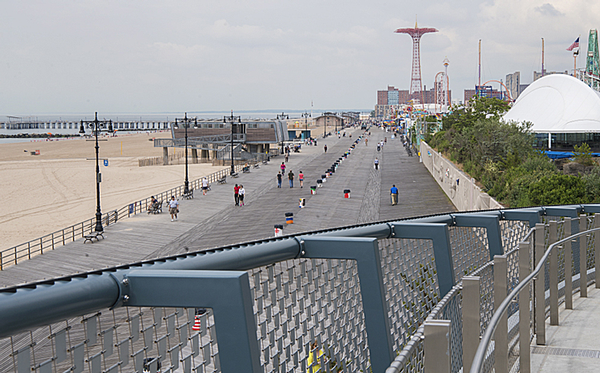 Along the famous Coney Island boardwalk in Brooklyn, there was little protection from the elements. As a result, just days before builders were scheduled to break ground on its new extension, the New York Aquarium was severely damaged when the Atlantic Ocean surged over the Boardwalk and into the six structures that made up the 14-acre aquarium complex, flooding multiple areas, destroying expensive electrical equipment and putting the lives of the collection at risk. The aquarium, which opened in Battery Park, New York, in 1896, moved to the site in Brooklyn in 1957. 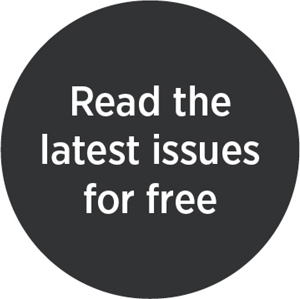 At the time of Hurricane Sandy it was already in need of significant restoration and following the storm, it was closed for an additional seven months, as power was restored and damaged buildings secured and cleared. Builders finally broke ground for the new building in early 2014 and it opened in June. 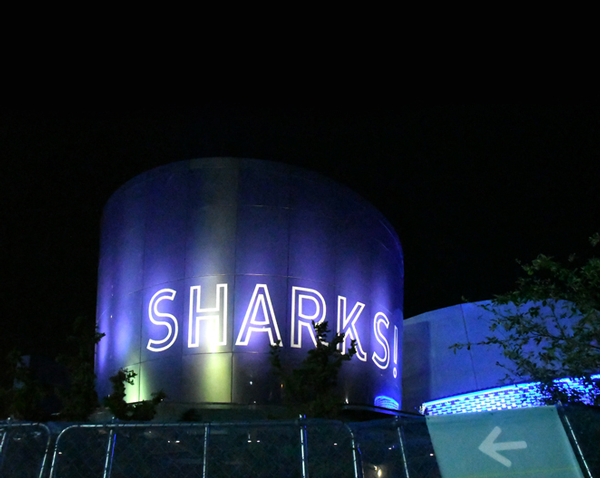 Called Ocean Wonders: Sharks!, around US$158m has been invested in the brand new three-storey development. 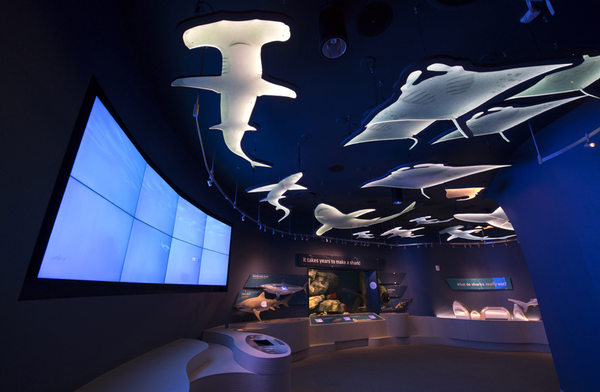 A 57,500sq ft (5,300sq m) space made up of nine different galleries, Ocean Wonders has been designed to build awareness of the importance of sharks to the health of the world’s oceans, as well as educating visitors about the severe threats which sharks face and inspiring them to protect New York's own marine wildlife. 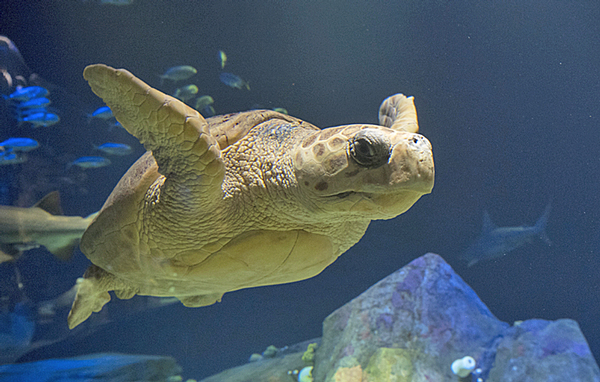 Included in the new exhibit are more than 115 species of marine life, including 18 different types of sharks. Visiting on a weekday the new addition, perhaps unsurprisingly, is significantly more crowded than the rest of the aquarium. 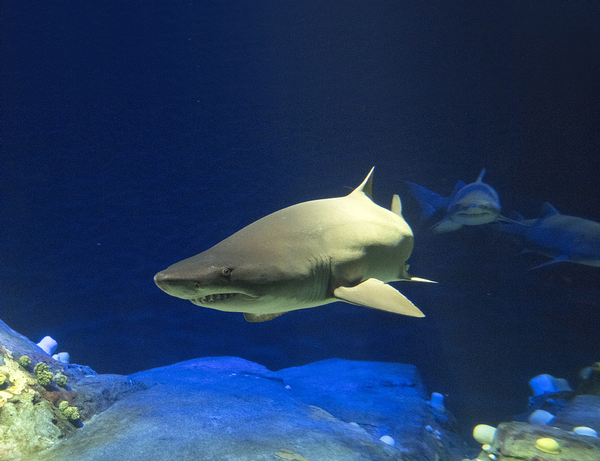 What starts as a more tranquil experience as you look around at the animals on display both indoors and outdoors is suddenly a challenge, as children excitedly take in the different types of sharks, so expect it to be noisy. 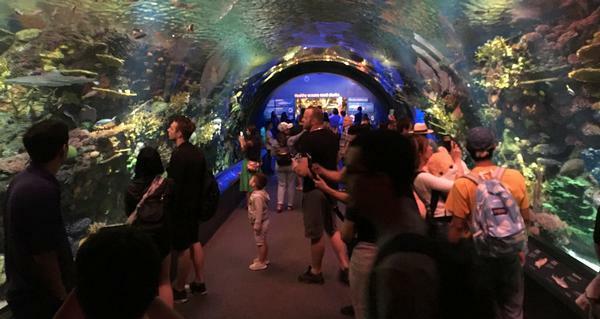 The new Ocean Wonders attraction is separate from the rest of the aquarium and to gain access, I had to join a queue which – on a weekday outside school holidays – was a very quick process. The staff maintaining the queue line were not hugely enthused to be handling the task. When asked questions about how to enter the new addition, they were passive in attitude, which didn’t make a great first impression. 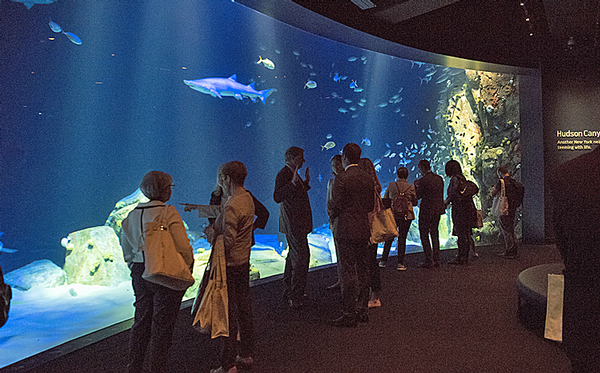 The first major visual is a walk-through acrylic tunnel, showcasing a coral reef environment. This stunning element is home to some smaller shark species, including blacktip reef sharks and zebra sharks, with other reef wildlife such as butterflyfish also on display. The experience is very immersive, with a mock shipwreck a fine example of this. 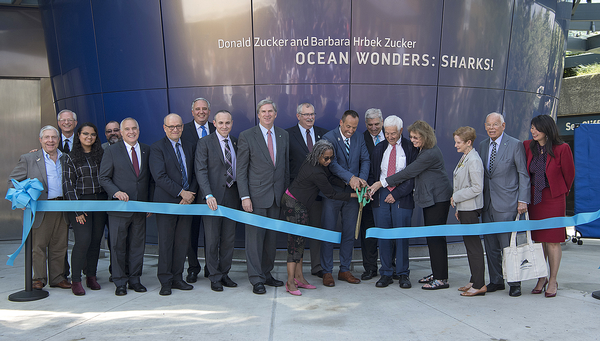 The focus of the messaging is the importance of sharks to our oceans and the new building houses a range of activities for children that teach them more about the animals. By taking part in these activities, they find out about the shark's relationship with New York City, as well as learning how they reproduce, move and breathe. Visitors also discover the threats faced by sharks and what they can do to help. 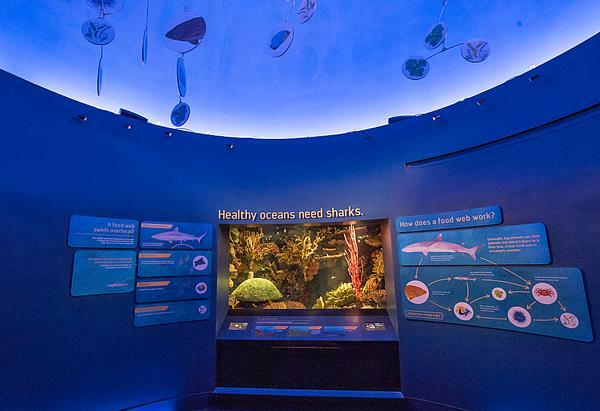 In this area, the tanks provide a window into the oceans, also detailing different shipwrecks in the waters off New York that have created their own ecosystems. Although visually engaging, when we visited, the expansion had only recently opened and was in need of some fine tuning, as quite a few of the interactive elements weren’t working. However, it didn't seem to affect things too much, as the children exploring the new space appeared to be having a very enjoyable experience. 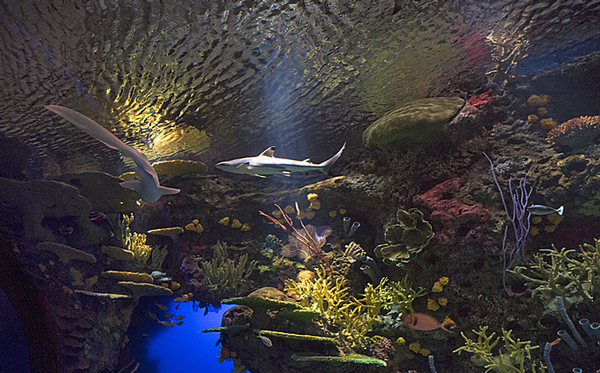 The main attraction is Canyon's Edge – a breathtaking space offering a window onto the world of sharks. With an entire wall taken up by the expansive main tank, the artistically-lit space seems to stretch on forever, fading away into the darkness. This puts prominence on the tank's inhabitants, which include nurse sharks, sand tiger sharks, sandbar sharks, and rough tail stingrays, as well as sea turtles. Leaving Canyon's Edge, the final part of the exhibition focuses on plastic. Hanging from the ceiling as you exit is rubbish which has been collected from the area. Accompanying interactives tell visitors what they can do to cut plastic use and keep the oceans clean. 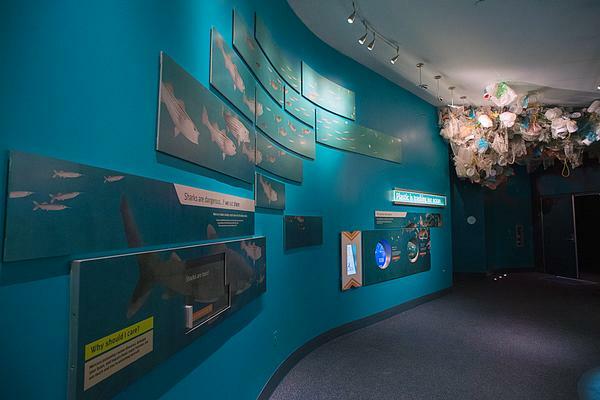 This area also features immersive exhibitions showing the real-world cost of overfishing and what efforts can be made to help sustainability. Using interactive screens in a restaurant setting, visitors can "place an order" for different types of fish and see whether or not it’s a good choice for the oceans. Upon exiting, there’s small gift shop selling items related to the exhibition. Presented as an "iconic" addition to the New York skyline, the building and exhibition design is a collaboration between the Wildlife Conservation Society's (WCS) Design Department, the New York-based Edelman Sultan Knox Wood, Doyle Partners, and Seattle-based interdisciplinary design firm The Portico Group. Standing alone on the boardwalk, the new building is dramatic and eye-catching. Chief architect for WSC, Susan Chin, has led the team to create a design which is "inspired by nature", with a facade that’s "alive and visually magnetic". Rising out of the boardwalk, the spiraling structure is wrapped in a 1,100-foot-long (335m) Shimmer Wall, which has been created by environmental artist Ned Kahn. The dynamic structure is designed to be ever-changing and driven by the forces of nature, and more than 33,000 aluminium flappers attached to the wall move individually with the wind. 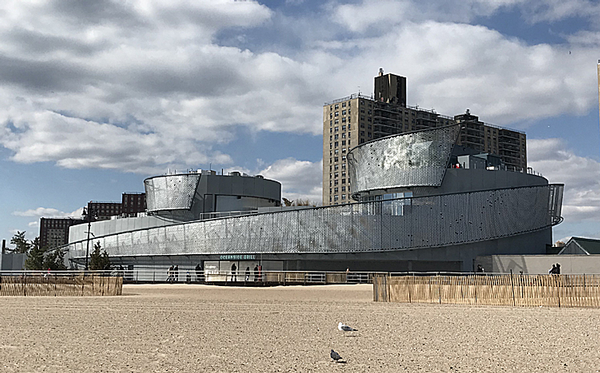 In addition to being able to explore the building's interior, a sloping pathway spirals around the outside, leading visitors to Ocean Overlook, an elevated viewing point which looks out over the Coney Island boardwalk, beach, and surrounding New York waters. From the lookout, guests can see important local habitats such as Sandy Hook, and enjoy sustainably-sourced food in the aquarium's rooftop restaurant. 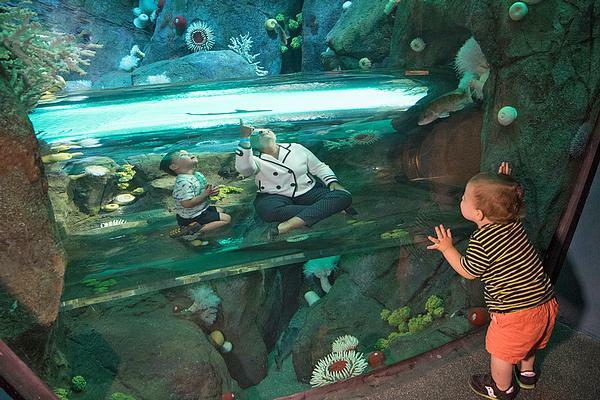 Education is a priority for the newly-opened attraction, with around 60,000 young people and adults expected to participate each year in the aquarium’s education programmes. To support this, the new building features a 1,500sq ft (140sq m) education space called the Oceanview Learning Laboratory on its rooftop. The space has an outdoor terrace where the aquarium’s education team offers a rooftop touch tank. The aquarium also offers dive talks, an overnight sleepover programme, field trips and a summer camp for kids. From a project that started in the wake of the devastation that was caused by Hurricane Sandy, Ocean Wonders: Sharks! is indeed a wonder. 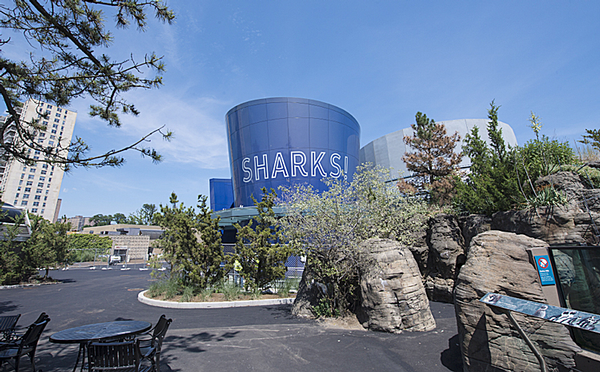 While there may have been some teething problems in the early stages of the redevelopment, the new attraction offers a spectacular experience to visitors, giving insights not only into the life of sharks, but also into the ecosystems of New York and surrounding waters.